Agriscience is an introductory laboratory science course that prepares students for biology, subsequent science and agriculture courses, and postsecondary study. This course helps students understand the important role that agricultural science and technology plays in the twenty-first century. In addition, it serves as the first course for all programs of study in the Agriculture, Food, & Natural Resources cluster. Upon completion of this course, proficient students will be prepared for success in more advanced agriculture and science coursework. This course counts as a lab science credit toward graduation requirements. Construction Practicum is a capstone course intended to provide students with the opportunity to apply the skills and knowledge learned in previous Architecture & Construction courses within a professional, working environment. In addition to developing an understanding of the professional and ethical issues encountered by tradesmen and contractors in the workplace, students learn to refine their skills in problem solving, communication, teamwork, and project management in the completion of a course-long project. Due to the importance of on-the-job training in the construction industry, a principle aim of the practicum is to assist students with placements where on-the-job training occurs, if available, so they can begin to log hours on a worksite and gain experience prior to entering the job market, such as in pre-apprenticeships. 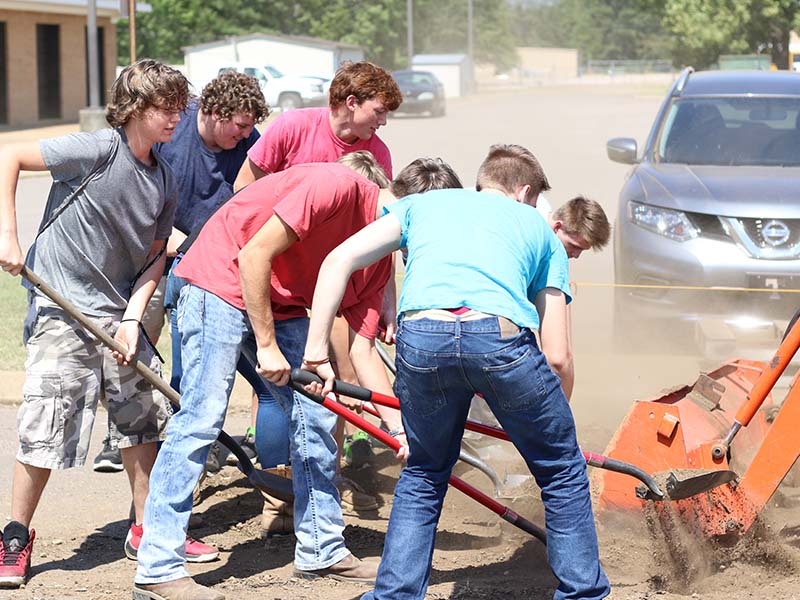 Additionally, students are exposed to the great range of postsecondary opportunities in today’s construction fields as well, in order to prepare them to make an informed decision regarding their post-high school plans. Fundamentals of Construction is a foundational course in the Architecture & Construction cluster covering essential knowledge, skills, and concepts required for careers in construction. Upon completion of this course, proficient students will be able to describe various construction fields and outline the steps necessary to advance in specific construction careers. Students will be able to employ tools safely and interpret construction drawings to complete projects demonstrating proper measurement and application of mathematical concepts. Standards in this course also include an overview of the construction industry and an introduction to building systems and materials. Greenhouse Management is an applied-knowledge course designed to prepare students to manage greenhouse operations. This course covers principles of greenhouse structures, plant health and growth, growing media, greenhouse crop selection and propagation, and management techniques. Upon completion of this course, proficient students will be equipped with the technical knowledge and skills needed to prepare for further education and careers in horticulture production. Greenhouse Management is a dual credit course with statewide articulation. Large Animal Science is an applied course in veterinary and animal science for students interested in learning more about becoming a veterinarian, vet tech, vet assistant, or pursuing a variety of scientific, health, or agriculture professions. This course covers anatomy and physiological systems of different groups of large animals, as well as careers, leadership, and history of the industry. Upon completion of this course, proficient students will be prepared for success in the level-four Veterinary Science course and further postsecondary training. Mechanical, Electrical, & Plumbing Systems prepares students for electrical, plumbing, and HVAC careers by introducing students to the physical principles of these systems and the fundamental skills needed to work with them. Upon completion of this course, proficient students will be able to follow safety procedures and use tools to perform basic operations with electrical circuits, as well as demonstrate understanding in fundamental concepts of electricity theory (i.e. Ohm’s Law). Students will be able to apply proper tools and procedures to perform basic operations with plastic piping, including measuring, cutting, and joining pipe. Furthermore, students will be able to apply mathematics concepts to solve HVAC, electrical, and plumbing problems. Standards in this course also include principles of the construction industry and business and project management. Students will continue compiling artifacts for inclusion in their portfolios, which they will carry with them throughout the full sequence of courses in this program of study. Environmental and Natural Resource Management is an applied course for students interested in learning more about becoming good stewards of our environment and natural resources. This course covers major types of natural resources and their management, public policy, and the role of public education in managing resources, as well as careers, leadership, and history of the industry. Upon completion of this course, proficient students will be prepared for further study and careers as an environmental scientist, conservationist, forester, or wildlife manager. Residential & Commercial Construction I is the second course in the Residential & Commercial Construction program of study intended to prepare students for careers in construction by developing an understanding of the different phases of a construction project from start to finish. Upon completion of this course, proficient students will be able to demonstrate knowledge and skill in the earlier phases of building construction, including site layout, foundation systems, concrete, framing systems, and electrical systems. Students will be able to perform concrete work; frame walls, ceilings, and floors of a structure; and install proper wiring while safely employing tools and interpreting construction drawings to complete projects. Emphasis is placed on demonstrating proper measurement and application of mathematical concepts. Standards in this course also include principles of the construction industry and business and project management. Students will continue compiling artifacts for inclusion in their portfolios, which they will carry with them throughout the full sequence of courses in this program of study. Residential & Commercial Construction II is the third course in the Residential & Commercial Construction program of study intended to prepare students for careers in construction by developing an understanding of the different phases of a construction project from start to finish. Upon completion of this course, proficient students will be able to demonstrate knowledge and skill in the later phases of building construction including roofing systems, exterior finishing, stair framing systems, masonry systems, and plumbing systems. Students will be able to perform masonry work; frame roofs; install shingles on roofs; apply exterior finishes; and install proper piping for plumbing systems while safely employing tools and interpreting construction drawings to complete projects. Emphasis is placed on demonstrating proper measurement and application of mathematical concepts. Standards in this course also include an introduction to heating, ventilation, and air conditioning systems, principles of the construction industry, and business and project management. Students will continue compiling artifacts for inclusion in their portfolios, which they will carry with them throughout the full sequence of courses in this program of study. Welding I is designed to provide students with the skills and knowledge to effectively perform cutting and welding applications used in the advanced manufacturing industry. Proficient students will develop proficiency in fundamental safety practices in welding, interpreting drawings, creating computer aided drawings, identifying and using joint designs, efficiently laying out parts for fabrication, basic shielded metal arc welding (SMAW), mechanical and thermal properties of metals, and quality control. Upon completion of this course, proficient students will understand the requirements to pursue the American Welding Society (AWS) Entry Welder qualification and examination and will be prepared to undertake more advanced welding coursework. Welding II is designed to provide students with opportunities to effectively perform cutting and welding applications of increasingly complexity used in the advanced manufacturing industry. Proficient students will build on the knowledge and skills of the Welding I course and apply them in novel environments, while learning additional welding techniques not covered in previous courses. Specifically, students will be proficient in (1) fundamental safety practices in welding, (2) gas metal arc welding (GMAW), (3) flux cored arc welding (FCAW), (4) gas tungsten arc welding (GTAW), and (5) quality control methods. Upon completion of the Welding II course, proficient students will be eligible to complete the American Welding Society (AWS) Entry Welder qualification and certification.